Day 1 of your Lower Grand Canyon whitewater rafting trip begins with a hike down the beautiful Bright Angel Trail from the South Rim of the Grand Canyon to Pipe Creek Beach (one mile below Phantom Ranch), where you'll be served lunch at the river. The whitewater rafting trip starts with a whirlwind of rapids on this section beginning in the heart of the ancient rock of the Upper Granite Gorge. You will plunge through the mountainous waves of Horn Creek, Granite, and Hermit rapids on your first afternoon. Infamous Crystal rapid and the rest of "The Gems" follow the next morning with Deubendorff, Upset and Lava Falls awaiting us in the days to come. Whitewater rafting is only part of the story on this lower stretch of the Grand Canyon. The Canyon is criss-crossed with hundreds of side canyons, each with its own personality and attraction. While it would be obviously impossible to explore each and every one, even in a lifetime, we make the most of our time to visit some of the most outstanding little corners on earth. Typical stops include the fern covered intimacy of Elves Chasm, hiking above Deer Creek Falls, and winding our way up Matkatamiba. Conditions permitting, we will swim in the turquoise pools of Havasu Creek and hike the talus to where Thunder River gushes out of a rock wall, several miles and a thousand feet above the Colorado River. Check the Photo Gallery for a sample of what these places hold. Downstream, basalt outcrops alert us to our proximity to Lava Falls and soon we hear its thunder reverberating from the canyon walls. Passage here always demands a good long look before dropping into one of the biggest of the "Big Ones". Below Lava Falls the river takes a breather and opens up to big skies and further vistas, but this is only temporary as some miles below the walls close in one last time as we descend into the Lower Granite Gorge. As the first explorers learned, to their dismay, the sheer walls of resilient bedrock create large rapids and we get a great last set of rapids bracketed by highly polished walls. Our last night's camp lies deep in the Lower Gorge where the river meets the upper reaches of Lake Mead. On our last morning a large jet-boat takes us safely and swiftly through the rest of the Canyon, past the Grand Wash Cliffs where the Canyon comes to a dramatic end on Lake Mead. At that point an air-conditioned motor coach provides transportation to the Las Vegas area. 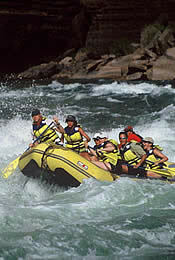 Start planning your Lower Grand Canyon Rafting Trip today by visiting Trip Dates & Rates or calling 1-800-637-RAFT. Due to limited availability, the National Park Service has limited use in the popular Lees Ferry to Diamond Creek section of the Colorado River to one recreational river trip per individual each calendar year. Because of this regulation, Outdoors Unlimited cannot accept a reservation from any individual who has or will participate in any other full or partial canyon commercial or non-commercial river trip within the same calendar year. If you have already completed or have plans to participate in any other Grand Canyon river trip this year and would like to go again, please respect your fellow boaters by waiting until next year or sometime thereafter to book your next trip. 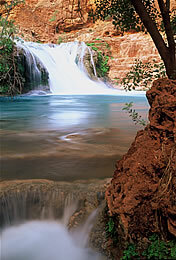 Grand Canyon National Park’s one-trip-per-year rule is strictly enforced.